The Wind-up Bird Chronicle (Nejimakidori Kuronikuru in Japanese) is one of the famous, Japanese novelist’s own favourite books. Written in 1994 – 1995 and translated by Jay Rubin into English, it is said to be one of Murakami’s key novels that provide insight into many other of Murakami’s novels and their characters. The Wind-up bird Chronicle tells the story of the young Toru Okada and his wife Kumiko. Toru Okada is a quiet, young man that enjoys having an easy life with cooking, ironing and drinking beer but when Kumiko suddenly disappears; Toru embarks on a journey to find her and discovers that there is so much more to Kumiko’s disappearance than he initially anticipated. Shortly before Kumiko’s disappearance, their cat Noboru Wataya vanished, which is also the name of Kumiko’s brother who, the reader quickly finds out, is deeply involved in Kumiko’s vanishing. This is by no means a coincidence. During his search for Kumiko, Toru makes the acquaintance of a very peculiar young lady, Malta Kano and her sister Creta Kano who help him to find his wife Kumiko in rather unexpected ways. Both of these women seem very bizarre to the reader but are still very likeable characters. Moreover, Toru Okada meets Lieutenant Mamiya who transports the reader into the world of war when Japan occupied Manchuria in 1937. The descriptions of these scenes, the war and pain are very lively and you can almost see yourself standing in Manchuria yourself. Following Lieutenant Mamiya’s story, who survived by sitting in a well, Toru follows to sit in a bottom of a well to think about Kumiko’s disappearance and experiences a rather surreal feeling when travelling into different spheres. 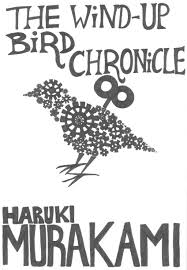 When I was lucky enough to hear Murakami talking about the Wind-up Bird Chronicle at the Edinburgh International Book Festival last August, he stressed that sitting at a bottom of a well would be his life-long dream. His character Toru Okada also enjoys the solitude he gets from this ritual which is actually an important connection to his wife Kumiko. Moreover, there are the encounters of Toru Okada and May Kasahara – a girl from the neighbourhood that Toru shares his thoughts with. May Kasahara has a very direct way of expressing her thoughts which is refreshing for Toru as well as for the reader. Posted in Arts and tagged book, chronicle, essential, read, windupbird. Bookmark the permalink.